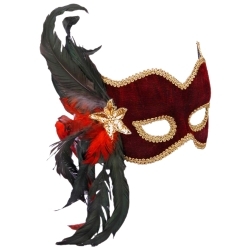 This decorative burgundy velvet masquerade mask is a great mask for Mardi Gras, masquerades, and other costume parties. Our directors also use this mask for the Masquerade Dance scene in William Shakespeare's "Romeo and Juliet". The burgundy velvet masquerade mask with feathers is made of rigid plastic covered in burgundy velvet with gold braided rope trim and attached decorative feathers.